Art Lessons by Olga Guy are designed based on your skill level. Olga Guy is a watercolor artist who will introduce you to different painting techniques to help you improve your skills and discover your own style. Improve your painting techniques . Learn about composition and color harmony. How to create stunning paintings with bright colors. Best ways to mat, frame and display your artwork at home or any art venue. How to sell your artwork. ▪	3 hour Lesson – once a week $100 a month. Fridays: 6:30-8:30 pm – painting support and guidance for grown ups with painting skills of any level. Victoria, 12. She has been taking Olga’s art lessons for almost two years. So far she has already participated in different art Exhibits and has entered 2 art contests. Taking 1st place on both occasions. Olga Guy is a Watercolor artist who specializes in subjects of nature. The use of vibrant colors on her semi-spontaneous paintings give her work a very unique style. She was born in Honduras in 1979. Olga discovered her passion for painting when her Kindergarten teacher complimented one of her drawings. As she grew up, this natural born artist participated in many art exhibits and contests and used to create murals on her bedroom walls and doors. At the age of 21 she obtained her Computer Programming bachelor’s degree. During her 20’s she lived in many places Like England, Malawi and Mexico. But it wasn’t until 2009 when Panama City became her new home and her painting hobby turned into a career. In 2013, she joined Panama City Artists Association where she learned that supporting and promoting local artists was very important for the art community. Olga decided to help with this cause, and she served as the Public Relations Representative for the association. The same year she started her own business: Olga Guy Art and Photography LLC and joined CityArts Cooperative and later she was given the position of Public Relations Manager. Olga has participated in different exhibits in the State of Florida. Her artwork has been displayed in most of the art venues in our county. 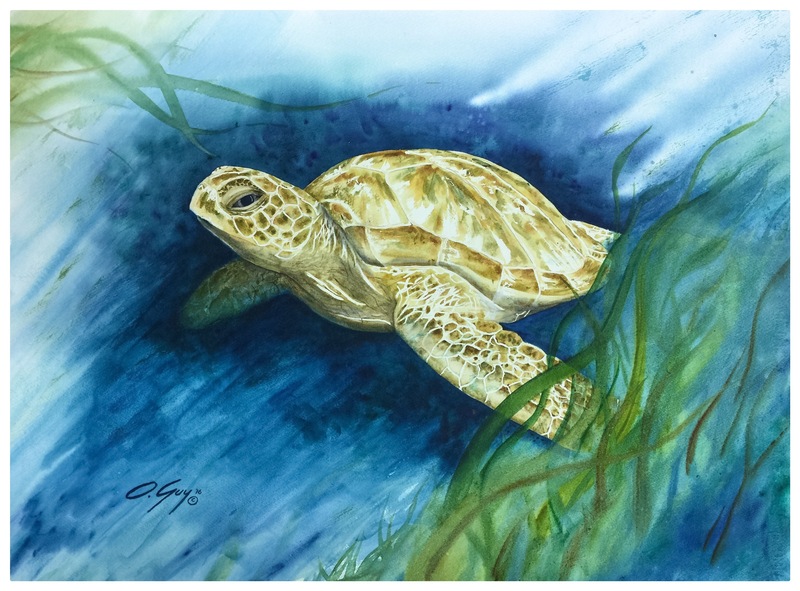 Her paintings “Tropical Aquarium”, “Clown Fish” and “Sea Turtle” won the 1st place in the watercolor category at the Bay County Fair Art Show in 2014, 2015 and 2016, respectively. Olga Guy currently dedicates her time to create exquisite watercolor paintings and teaches art lessons at her private studio. She also continues to support activities to help promote the local art and artists in Bay County.